Invisalign® is the invisible way to straighten teeth without braces. Invisalign® uses a series of clear removable aligners to straighten your teeth without the hassle of metal wires or brackets. Invisalign® has been proven effective in clinical research and in orthodontic and dental practices worldwide. Clear aligners are worn for about two weeks, removing them only to eat, drink, brush and floss. As each aligner is replaced with the next in the series, the teeth move little by little until they have straightened to their final position. Checkups with your dentist are necessary every six weeks or so to ensure that treatment is progressing as planned. Each case is unique and the timeline depends on the specific needs for your teeth. Most cases take about one year to complete, however, some simple cases can be treated in 6 months or less. Please contact us today to schedule a consultation to discuss what Invisalign can do for you! 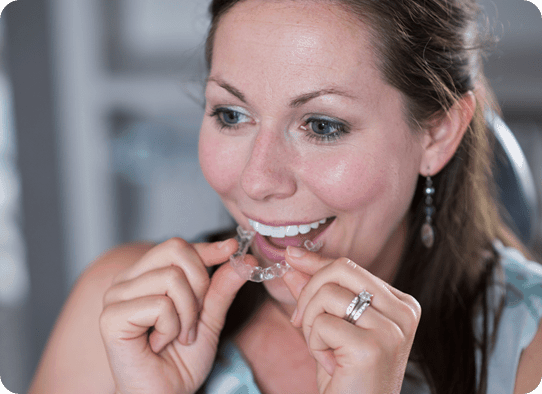 Want to know if Invisalign is right for you?